I first visited the Poor Knights in April 1992 when I did some dives on a day boat and also from a liveaboard. 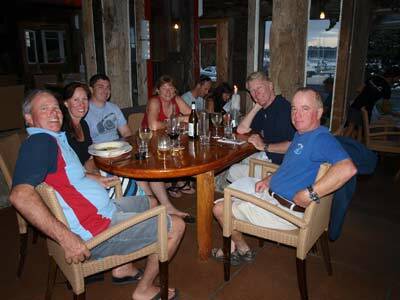 In March 2011, a group of members from St George Scuba Club did a dive trip to the Bay of Islands and the Poor Knights. I had been trying for almost 20 years to get member interested in a dive trip to New Zealand without success, so it was great that Kelly and I could finally get to dive this area. The Poor Knights is about 180 kilometres north of Auckland, NZ's largest city. It consists of two large islands and some smaller ones. They were named by Lieutenant James Cook, RN, in 1769 when aboard his famous trip about HMS Endeavour. There are a couple of ideas as to why he named them the Poor Knights. The first is that the islands resembled an English dessert of the day, Poor Knights. The second is that when viewed from between the islands and the mainland, they look like two knights lying down on their backs. The islands are spectacular, with the water around them as blue as the tropical seas of Papua New Guinea. It is just over 20 kilometres off the coast. There are only two small towns near the Poor Knights, Tutukaka and another place called Ngunguru which is only a few kilometres away. Other than this, all the other places shown on maps are just localities. You can fly into Auckland from most Australian cities as well as many other places. Flights come from the Cook Islands, Chile, Argentina, Fiji, Vanuatu, Japan and major Asian cites. From Australia, there are choices of Qantas, Air New Zealand, Pacific Blue, Emirates and some South American airlines. We flew Emirates as they have full service, a 30 kg baggage allowance and the flight is on an Airbus A380 (very comfortable, lots of leg room). They were also the cheapest for full service flights. Note that a lot of the Air New Zealand and Pacific Blue flights found on the net do not include luggage at all and no service. It is about three hours from Sydney, a bit more from Melbourne and Brisbane. The best flight to catch is one leaving Sydney about 8 am or so as this will get you to Auckland just after 2 pm. This way, once you are through customs, you will have time to drive to Tutukaka and still arrive at a reasonable time. From Auckland, it is about two and a half hours drive to Tutukaka. You will really need to hire a car, as there is no other way to get there. Do a Google search and you can find some cheaper off-airport hire firms. We hired a 14 year old second-hand Japanese import Nissan Cefino station wagon which was not a bad car, although the rear suspension was not great and it only had a space saver spare tyre (we know this as we had to change one on the other car). This easily fitted three divers and gear, including one with a rebreather. Fuel economy was a reasonable 10 litres per 100 kilometres. Fuel costs about NZ$2.15 per litre, which at the time was about A$1.57, very similar to prices outside the major capital cities in Australia. If you arrive about 2 pm, you will be on the way by 3 pm or so. You will probably need to stop along the way to get some supplies. There is a good supermarket at Warkworth (town is just off the main road) and another at Whangarei. You can get beer, wine and spirits in the supermarkets, as well as food. There is a small store at Tutukaka and another store at the Ngunguru, but they do not stock everything. It is best to get what you think you will need before getting to Tutukaka. You travel north along Highway 1, via all the Ws, Warkworth, Wellsford and Whangarei. You then take one of the many exits to Tutukaka. There are a number of dive operations that advertise that they service the Poor Knights. However, there is only one shop, the rest are just dive charter boats as far as I can see. Most of them would only operate if they have a specific charterer. Do a Google search to find them. All operations are based at Tutukaka Marina. We used Dive! Tutukaka. This is located opposite the marina as you near the waterfront. It is at the back of the Snappa Rock cafe/restaurant. Dive! Tutukaka has at least five boats. The largest one is dedicated to sightseeing, but also does diving for people with non-diving spouses/friends/children. The next smaller one (still very large) is for divers doing a one-off trip. It is normally filled with back packers etc. The next boat is the pick of the bunch. It is large enough for at least 16 divers but they tend to put the more experienced divers on this boat or the ones doing multiple days' diving. There is another largish covered boat and a smaller (but still large) open boat. This last one is used for shorter trips to the wrecks of HMNZS Tui and HMNZS Waikato. All the boats have lots of room and plenty of dry space and a toilet. The diving is run as a double dive, with the surface interval spent out at the island. It is a long way out, at least 25 kilometres by the time you travel out of the marina and harbour. It takes at least one hour to travel out to the islands. For the first day you meet at 8 am to fill in paperwork etc. Subsequent days are 8:30 am. Departure is 9 am. Gear is not set up till you arrive at the Poor Knights and you stay in your normal clothes (take a jumper as even in summer it can be cool on the way out). The waters around Poor Knights are generally very calm as there is always a calm side. The trip out though can be rough. The dives to the wrecks are a little different, you gear up at the marina and come back between dives. For the large boat I assume that divemasters may be compulsory. For the third boat, you do not need to be accompanied by one and we never were. In some cases, the level of "supervision" can be a bit onerous, aimed at a very low level. For example on the first day the divemaster asked me how many dives I had done and then how much weight I was using. He then told me how much weight I should use! As this was two kilograms more than I know I need (using exactly the same gear I use in Sydney), I had to be a bit forceful to tell him I would not be taken the amount that he suggested. You would think that he would guess that a diver who has done over 3,000 dives would know what amount of weight they need! In addition, that first day the divemasters were a abrupt in advising where to store gear etc. However, after the first morning they were a lot more relaxed. After the first dive, you are taken on a bit of a tour of the island, to Riki Riko Cave (the largest sea cave in the world) and then to the site of the second dive. Lunch is provided (if you want - NZ$10 - sandwich, apple, banana and large cookie) but no water is provided. Hot soup/tea/coffee is provided after each dive. It is wise to take a towel for use between dives and so you can change after the dive back to your dry clothes. There is a cold water shower on the back deck. After a good surface interval you do your second dive and then head back to the marina (sometimes with more sightseeing on the way). You are normally back at the dive operation at just after 4 pm. Only aluminium tanks are available. I believe that nitrox may be available. They have a lot of hire gear. In addition, the owner of the operation gave us an excellent talk one night about the acquisition and sinking of HMNZS Tui and HMNZS Waikato that was very interesting. Despite what we at first thought would be the case, the diving was very relaxed, no dive Nazis telling you what you must or must not do, good dive briefs and just the right amount of assistance. Dive cost was NZ$150 (A$110) per trip (including tanks/weights and lunch). This included a discount for multiple people and days. 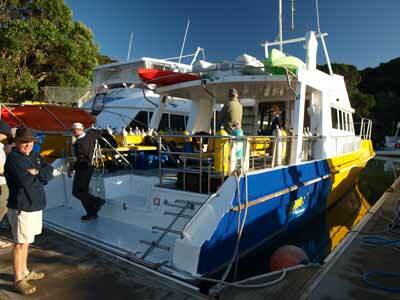 Costs for individual dives are on their web site. There is not a great deal of accommodation options. There is a fancy hotel (Oceans Resorts Hotel) which costs A$140 to A$280 a night (for two people). This is the closest accommodation. 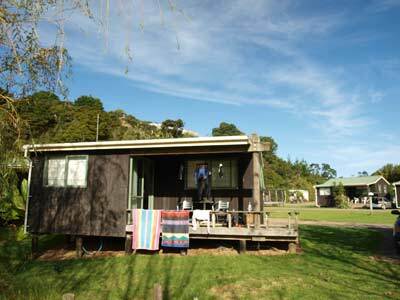 We stayed at the Tutukaka Holiday Park. This is only a few minutes walk from the dive shop and marina. We hired cabins which had a double bed and two bunks in two rooms and a kitchen. Cost was NZ$140 (A$102) a night for two people. They also have a good BBQ area and camp kitchen. There is also an excellent dive gear washing and drying area. Consult the dive operation or Google accommodation. The cabins had small balconies where we had afternoon nibblies and drinks. We decided to have breakfast at the cabins and eat out each night, with one barbecue at the holiday park. We purchased breakfast items and things like cheese and biscuits for pre-dinner drinks at Whangarei. We also purchased beer and wine and soft drinks. You should do this on the way to Tutukaka as the small shops do not have the greatest choice. Beer cost about NZ$15 to $20 a 12 pack. Even the premium beers were available at NZ$20 on special, this equals about A$30 a carton. Great value. Some beers we tried and liked were Tui East India Pale Ale and NZ Pure. 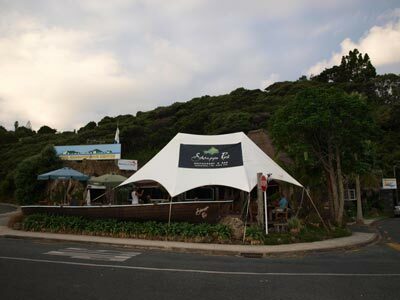 As well as the barbecue, we had dinner twice at the Whangarei Anglers Club. This was cheap and quite good, although there was not a huge choice (something we noticed at most restaurants we visited in NZ). The beers were also cheap. We had one dinner at Snappa Rock. This was a big night, entrees, mains, desserts, wines, beers and a bottle of port. Cost was still only NZ$70 each (A$53). Food was very good. We also ate at the Oceans Resort Hotel. This was pretty good and some parts of the meal were on special (eg two entrees for the price of one). Another night we ordered pizzas from the Marina Pizzeria. We took these back to the holiday park and ate them on the grass camping area. Very good and cheap, NZ$102 for five large pizzas, less than A$13 a person. There are literally hundreds of sites you can dive. Click on this linkto see the ones we did when at the Poor Knights. All were great, especially the reef dives. Water temperature was about 22ºC in March. Visibility was generally 25 to 30 metres. Combine this with some diving at the Bay of Islands. I would suggest four days at Bay of Islands (three at least) and four or five at least at the Poor Knights. It is only about 90 minutes drive to Tutukaka from the Bay of Islands area (a bit more if you need to stop for food etc). As mentioned, we at first thought that Dive! Tutukaka may have been a bit too much aimed at the cattle class of diver, but they looked after us fine and allowed us a lot of latitude. We were first in the water and most times the last ones out. I can certainly recommend them. Note that if you have a group of at least six, you could also use Yukon Dive which was recommended to us by the operators that we used at the Bay of Islands. They were the only other dive charter operation that we saw out at the Poor Knights over five days. The total cost of a 10 day trip to New Zealand for diving, with 8 days diving and 16 dives, accommodation and transport was NZ$1847 which equals A$1358. Airfare was A$420 return from Sydney to Auckland. Therefore, before other spending, the cost was A$1778.